It is author's debut book. His rapidly increasing dreams with diverse experiences propelled him to write a fiction for those who aspire to study abroad and make it big and for those who have already aspired to stay abroad and now think the big is somewhere left in India. It's a story of Kartik, a small town boy of Ratlam which is famous for Ratlami Sev, a delicious deep fried snack in Central India. He wants to go to the USA for pursuing MBA. There are others characters too like Kartik's mom and dad, and his younger sister Aditi. He got admission to an engineering college in Indore where he meets Raghav, a fair boy with an average physique. Kabeer, the ever sarcastic and insult-slinging jokester who had a tanned complexion with spiky hair. Sonia, a confident and independent Punjabi girl. She was pursuing a Chartered Accountant (CA) course in Indore and love interest of Kartik. His father was a very religious man and strict too. Every character and their conversation portrayed very well. The way Kartik told his parents about MBA and their reaction, typical Indian mon who don't want to see her son go abroad; a dad who is worried about finances; a sister who is excited because she got a gift from the USA. The way Sonia's and Kartik relationship started and then insecurity arises everything is described very well. The second half of story was more interesting than the first one when finally, Kartik landed in the USA. He got admission to the University of Massachusetts, Boston. 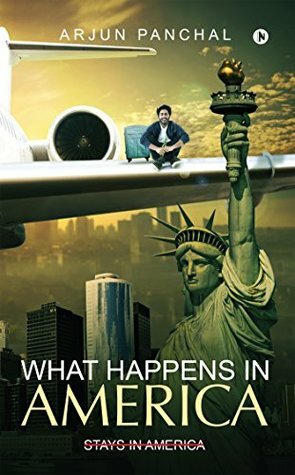 In the USA he faces cultural shock, the food, weather change, rupees to dollars exchange calculations, finding a new job, completely different education system, long-distance relationship with Sonia and a lot more. His life changed completely. He meets new people and starts a new chapter of his life with them Kartik understands the difference between reality and dreams in the USA. Here he did those things which he never ever dared to do in India. He learned a lot of new things and his experiences were described very well. His relationship with Sonia was on the stack because of his dream but he can't help it and things get a turn after the Vegas trip. Well, the author described sinful city Las Vegas very well that it becomes my favorite part. There are so many emotions and the unspoken layer of friendship which change Kartik's life forever. I really like the end of this book where the author left his readers with a question and you were thinking of the answer. He did a great job, excellent storytelling. It's a must-read for everyone especially who are planning to go abroad for studies or living there.